Look at the whorls on your index finger. Every fingerprint is almost entirely unique – that’s why they’ve been dusted for crime detection for more than a century. Technology is moving on. Biometric scanning is the process of checking a fingerprint, iris, or face pattern with a technological device. But what does the mass introduction of Biometrics mean for your privacy? 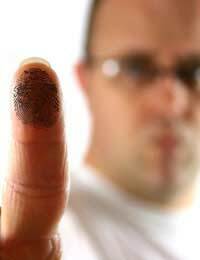 Biometric scanning is the process of ‘reading’ a physical feature such as fingerprint, iris, face, vein, or voice. When you present your fingerprint or iris, the biometric reader creates a digitised template which will be used to recognise you in the future. The template is stored, either in a central system, or on your card. Where is Biometric Scanning Used? Biometric scanning is already used in many workplaces, high-tech laptops, and on passports in some European countries. It is also being proposed for the new Identity Cards which could soon be compulsory in the UK. Biometric scanners are currently used to register asylum seekers and monitor travellers passing through major airports. The UK and USA are in discussions about sharing their biometric information in the anti-terror campaign. In Europe, the sharing of information between police and immigration officials is being orchestrated. The Home Secretary recently remarked that the UK could not hope to improve its security systems by remaining inside a “bubble”, insisting that this sharing of personal biometric data is crucial to a safe future. Ever since a secondary school tested out a top-notch Biometrics system for dishing out school dinners, then declared it too slow, and worth another try in 12 months, biometric testing has been something of a laughing matter. Will it really be good enough for our national security? The National Physical Laboratory carried out tests on behalf of the Home Office, which is looking for two methods (a primary and a back-up) to use on the new Identity Cards. The report indicated that minor factors such as a cut finger, poor light, bad positioning, watery eyes or contact lenses influence the success of scanning. 98% of fingerprint scans resulted in the successful acquisition of an image and 100% of facial scans produced a usable image. The report also showed that, once an image was produced, the number of false matches was quite high. What Are The Risks To Your Privacy From Biometric Scanning? In terms of privacy, the main concern with biometric scanning is the storage and handling of any data acquired by biometric systems. The UK government does not have a reputation for handling information securely. It’s already tentatively proposed sharing biometric data from the National Identity Register with banks and supermarkets, and is in talks to give out more information to other countries, resulting in a lack of privacy. An ex-MI6 operative said that the National Identity Register is a “present” for terrorists – a fantastic target for misuse or destruction. The privacy concerns here are international. Although we’re protected by the European Convention on Human Rights, and by the Data Protection Act, other countries have different laws. Critics are already worried that the new biometric passports will be too easy to read, record, and pass on.